Ryan Ariola, center, and his doctors, Kara Yamamoto and Dave Kurahara of Shriners Hospital, attended the kickoff dinner for this weekend's Camp Mana'olana for kids with arthritis. Ryan, a counselor at the camp, has juvenile rheumatoid arthritis and juvenile dermatomyositis. Ryan Ariola of Aiea has a lot to celebrate on his 13th birthday Tuesday, and he hopes to do it at a bowling alley. The youth said he began bowling during a family vacation in June at Big Bear, Calif., "and I couldn't leave it." He was bowling with his father, Steve Ariola, when interviewed Friday. Ryan was diagnosed at age 6 with juvenile rheumatoid arthritis and juvenile dermatomyositis, a disease causing a skin rash and weak muscles in children. His arthritis is in remission now and "his health is 100 percent," said his mother, Rachel Ariola. "Ryan is just an incredible boy. He plays Little League baseball, he enjoys bowling, and we take him skiing. He is not limited in any way by his arthritis." He has been to Washington, D.C., twice with his family to lobby Congress for more support for the Arthritis Foundation. Rachel is on the board of directors for the foundation in Hawaii and for three years has chaired the arthritis walk in May, and the whole family volunteers. The Ariolas have another son, Gavin, 10. "Ryan is a very articulate boy, a very good speaker," his mother said. "His mission is to broaden awareness that arthritis isn't just something you get when you're older. Over 300,000 children have arthritis." She said it isn't known how many Hawaii children have arthritis, but Shriners Hospital for Children has more than 150 active cases. Ryan was excited to be a counselor this weekend at Camp Mana'olana, sponsored annually by the Arthritis Foundation, Hawaii Branch, for children with arthritis. He has been a camper for six years. "He has the mobility to be there and help with sympathy and compassion, knowing what it's like to be limited," Rachel said. About 14 children and teenagers, ages 8 to 18, participated in the camp, which began Friday at the Hilton Hawaiian Village. Activities included attending the Cirque Hawaii show, pool exercises, arts and crafts, and nutrition information sessions. A hotel may seem an odd place for a camp. But "given the nature of the kids, some in wheelchairs, it's easier to have more facilities available," Rachel said. "We used to do it in a beach house and it became an ordeal for the kids." Ryan said the best part of the camp is making friends "who are all just like me." His favorite camp activities in past years were late-night crabbing and competing in a cookie-decorating contest. The first sign of his medical problems occurred at age 6, in the first week of first grade, when he dropped a pencil from his desk, his mother said. When he bent to pick it up, "his neck seized up," she said. The school nurse called her and said Ryan couldn't turn his head, she said. "His jaw was locked. He was in extreme pain." His pediatrician couldn't find the cause and referred Ryan to Shriners. It took a few months and myriad tests to identify the cause, she said. A muscle tissue sample was removed surgically from his thigh for testing. The doctors said to keep Ryan moving, Rachel said. "Every day after school, we put him on a bike. We tried not to focus on his pain." His twin disorders eventually were diagnosed. Juvenile rheumatoid arthritis is an autoimmune disease in which the immune system begins to attack healthy cells and tissues instead of fighting off bacteria and viruses. Juvenile dermatomyositis is a disorder caused by inflammation in the blood vessels. "We had complete hope and faith in Shriners to help us," Rachel said. "We were very surprised when they diagnosed it as arthritis, but once we knew what we were working with, Shriners took good care of him. "We're so blessed," she said, adding that she "can't say enough good things" about that hospital. 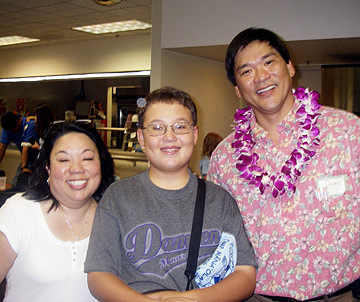 Ryan's Shriners doctors, Dave Kurahara and Kara Yamamoto, "are very good people," the teen said. "They diagnosed and gave me medication and that's why I'm in remission. "The only problem in Hawaii is there are not enough rheumatologists to go around on all the islands," he added. "We've got to put more people through that school so we can have more rheumatologists around."